Also on the Chery stand at the ongoing Auto Shanghai 2015, besides the Arrizo M7 (Maxime) and Tiggo 5 1.5T, are two new-energy vehicles that the Chinese carmaker could soon launch – the Arrizo 7 PHEV and Arrizo 3 EV. 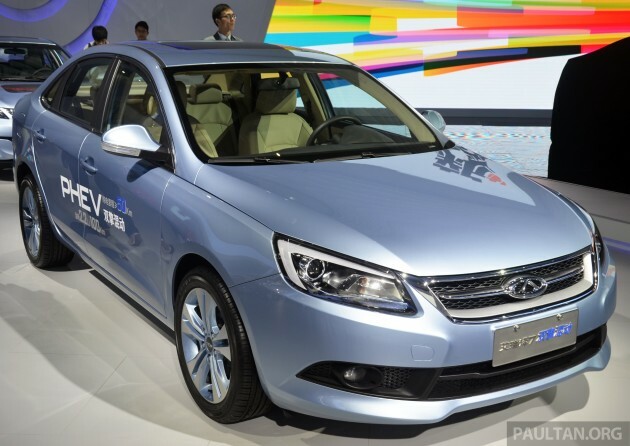 Displayed as a carbon-fibred concept in Beijing last year, the Arrizo 7 PHEV incorporates Chery’s new iPOWER system, which joins ACTECO traditional energy with ETECO new energy. The result of 18 years of development, iPOWER encompasses hybrid, plug-in hybrid, electric vehicle and start/stop technology. In the case of the Arrizo 7 PHEV, a 1.6 litre E4G16 DOHC four-cylinder engine joins forces with a 355-volt lithium-ion battery and a CVT gearbox to offer a claimed fuel economy of 2.2 litres per 100 km and a 50 km electric-only range. Chery claims a full charge takes four to six hours from a 220-volt household source. Meanwhile, the little Arrizo 3 EV’s claims are no less impressive, including a 260 km range and a 30-minute charge time to 80% battery, but other numbers are scarce. In China, Chery currently sells the eQ, an electric version of the QQ city car, for around 160,000 yuan (RM93k), without incentives. That Arrizo 7 PHEV could probably be the best looking car Chery had every produced. really surprised! Every automaker know China a huge market, to participate in these shows mark their standard in the auto industry. Yet Proton spoke about export cars and appointed international distributors. Proton failing to participate in for a few auto show for passed 6mths and from public perception it show lack of commitment to exports cars or another Proton sandiwara or drama. The public want Proton to show the latest IRIZ models only not Proton concept cars (if you have a concept car to show) to the world and be proud of your standards from your creation. Why Proton did not showcase IRIZ models (EV,Diesel, Petrol, Hybrid) on these grand auto shows and get exposure by press coverage by International auto journalist, blogger, writer, media, TV news coverage (local and international), YouTube. Is Proton really shy, lack of funds, afraid to hear or read negatives critics and comments?